Compatible with most Android™ devices and all Apple® products. Requires Wi-Fi connection or data plan. Live customer support available at all branches and technical support available 24/7. (1) Data and internet usage rates may apply. EMV refers to Europay, Mastercard®, and Visa®. (2) EMV is a registered trademark owned by EMVCo LLC. (3) CELL IT® Plus Rates apply to Mastercard, Visa, and Discover transactions. Market rates apply to American Express. (4) Next day funding availability subject to approval. CELL IT® Plus services subject to approval. (1) Monthly volume calculated based on total sales volume. 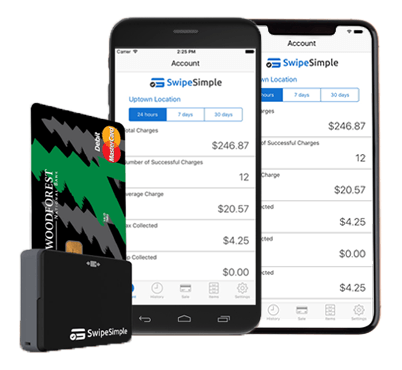 Merchants can use the Cell It® Plus mobile reader to qualify for swiped rates. Mobile transactions are never stored on the merchant's phone. Merchants can process payments securely away from their store front or office. Great for trade shows, in-home sales, festivals, craft fairs, flea markets, coffee kiosks, etc. Merchants can process and track credit card and cash transactions and void or refund transactions all on the same device. Capture relevant transaction information for your business – i.e., transaction volume, average transaction, inventory tracking. Processing services provided by Paysafe Payment Processing Solutions, LLC® as a registered agent of Woodforest National Bank®, The Woodlands, TX USA. For complete details regarding our products, services and related fees please speak with a Woodforest retail banker.